In this setup two remote branch offices are connected to the virtual center of the headquarters. One branch office has an ESXi 5.0.0 and the other an ESXi 5.5.0 The HQ virtual center is at v. 6.0.0, recently upgraded. The surebackup jobs of both BO are configured directly to their hosts (and not to the vc). most vms in the sb job fail to power on. There have been several changes and upgrades to the infrastructure recently so it is not possible to track down the beginning of the problems to a specific change. I have no clues of what it can be and don't know if I have to search in Veeam or VMware direction for causes. Before opening a case I'm looking for suggestions here. What does Veeam server show when SB job fails? Also, please try to perform an instant recovery of any VM to see if that will work. Instant recovery: very similar behavior. The recovered vm shows up in the vClient connected diretly to the host but does not appear in vCenter. 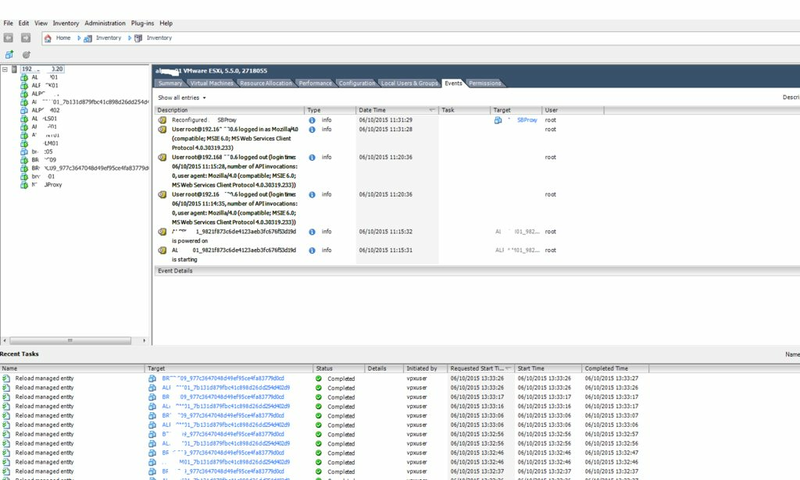 Stream of "Reload managed entity" in the Recent Task pane of the host-connected vClient. When SB job fails the Veeam server shows the vms failing to start because "OS did not boot in the allotted time" (3600 seconds). If the very same VM does show up in vClient connected to host and does not show up in vCenter that seems to be a VMware related issue.